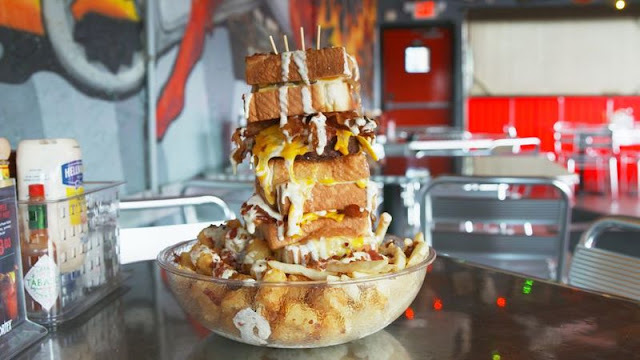 The Quadruple Coronary Bypass burger is a giant and terrifying culinary creation that only two people have ever able to finish it. If you are a professional eater then this massive burger might be in your favorite food list. The super burger is created by The Vortex, a restaurant based in Atlanta, and it consists of two eight-ounce sirloin patties, four four-ounce sirloin patties, 28 slices of cheese, four fried eggs, 27 strips of bacon, eight thick slices of Texas toast and the whole burger is stuffed with grilled onions, mustard, mayonnaise, ketchup, relish and a special sauce called "Cheesy-Cheese Goo" for an extra flavor.